Repair Fittings: Pipe Extenders, Pipe Splices, Inside Pipe Couples, Telescoping Couples, Inside Pipe Plugs, Snap Tees, Fitting Extenders. Inside Pipe Extenders Inside Pipe Extenders to glue into a piece of pipe broken off. Available for Sch 40 (1/2" up to 14") and Class 200 pipe (1" to 2"). Also Pipe Bell End Extenders to add just a short length of pipe to an existing pipe. Inside Pipe Couples Glues inside Sch 40 PVC pipe to couple 2 piece of pipe together, on the inside. 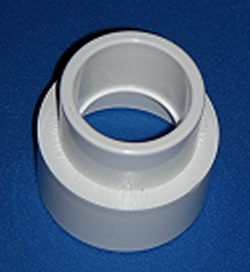 Bell End Pipe Extensions Glues on to PVC pipe to extend the length a short amount. Available for Sch 40, Class 200 and some SDR21 pipe. Extra deep (long) PVC Pipe Couples. These are great for a variety of troubles. Extra long couples for higher pressure situations (on both rigid and flexible pvc pipe), great for mis-shapen pipe or pipe that is not cut properly or a host other uses when you need the extra depth. About twice the length of standard couples. Sch 40 fittings fits Sch 40 pipe as well as Sch 80, Class 200, Class 125, Class 100, Class 160, SDR21, etc pipe. Any IPS plastic pipe. Sch 40 Fitting extenders These fittings go over most Sch 40 pvc fittings to extend the fitting so you can glue a new piece of pipe to something that may have a piece of pipe broken off inside it. Snap Tees These Tees snap over Sch 40 pvc pipe and allow you to "tap" into an existing pipe and locate a branch. Universal Reducing Adaptors These are black, ABS plastic reducing adapters. Unrated, good for vacuums, hoses, pipe and other non-standard applications. Look here when you have to reduce from one size to the next and can't find it anywhere else. Inside Pipe Plugs These plugs not only glue into the pipe, but the center section actually un-threads to provide you with a FPT tap one size smaller than the pipe. 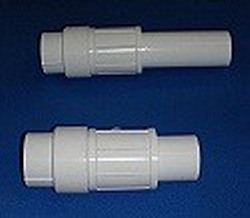 Ie, if you glue one of these fittings into a 2" pipe, you provide yourself with a 1.5" FPT port or tap by just un-threading the plug that comes with it. Telescoping Couple This couple allows you to cut into an existing pipe that has damage, such as a crack, cut out the bad part and the put this item in it's place. The one side glues either directly into a fitting or on to a pipe and the other side slides out to connect to the other part of the original pipe. Potable water rated and NSF rated! 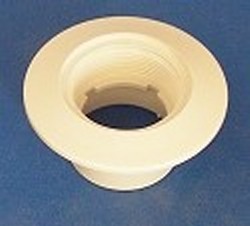 Inside Pipe Flanges Glues into PVC pipe and provides a flange to the end of the pipe. Aka, Return Wall Fittings. Links to Repair Tools below: Inside Pipe Cutters, Pipe Cutters, Saw Blades, Cable Saws.